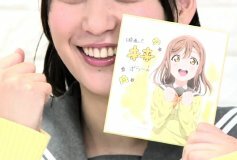 This was a live broadcast by the seiyuu of Love Live Sunshine. 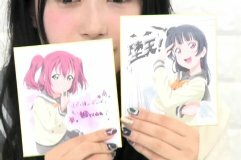 The hosts were Azalea and Guilty Kiss. Cyaron was in Kanazawa for their event the next day. 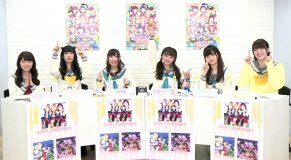 The seiyuu read a lot of mails and talked about the movie, and the new songs in the movie. In the School Idol Festival challenge corner, they played the song "Hop? Stop? Non Stop!" Since there were 6 people, the 3rd years played two fingers and the others played just one. The next School Idol Festival event will be an Osanpo Rally, with the locations in Italy. They played the song "Brightest Melody". At the end, they gave out lots of information about new goods. For the third week of the movie, the present is the mini picture boards of the 1st year students.